Hi, I am Noelle Frances Ferry and I greatly enjoy counted and surface embroidery. The happy zebra is one of my first embroidery projects and has been on constant display. My mother taught cross stitch, crewel, and needlepoint to my sister and me. I went on to learn long/short, Brazilian, and Bargello by purchasing kits and books. 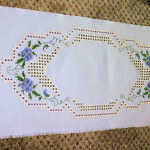 When I first saw Hardanger and wanted to create a table runner I ordered a Permin of Copenhagen needlecraft kit. It arrived with everything (chart, threads, fabric) but the stitch direction were one line drawing of each stitch. Web surfing I found the Hardanger store Nordic Needle. They offer supplies, books, alot more, and their series of “To Learn” Hardanger bookmark kits. I purchased their four lesson pieces, worked my way through them and weeks later, when finished, I was ready to try my hand at stitching the table length runner which I proudly show here below. That, the runner, took me months of work and then when finished I was afraid to snip the finished piece along its buttonhole stitches border! 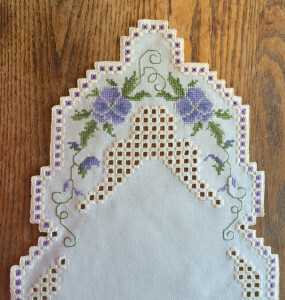 It was displayed as shown in the photo, on a cabinet top, for many years until I worked several Hardanger projects and got enough confidence to snip along the buttonhole edge. 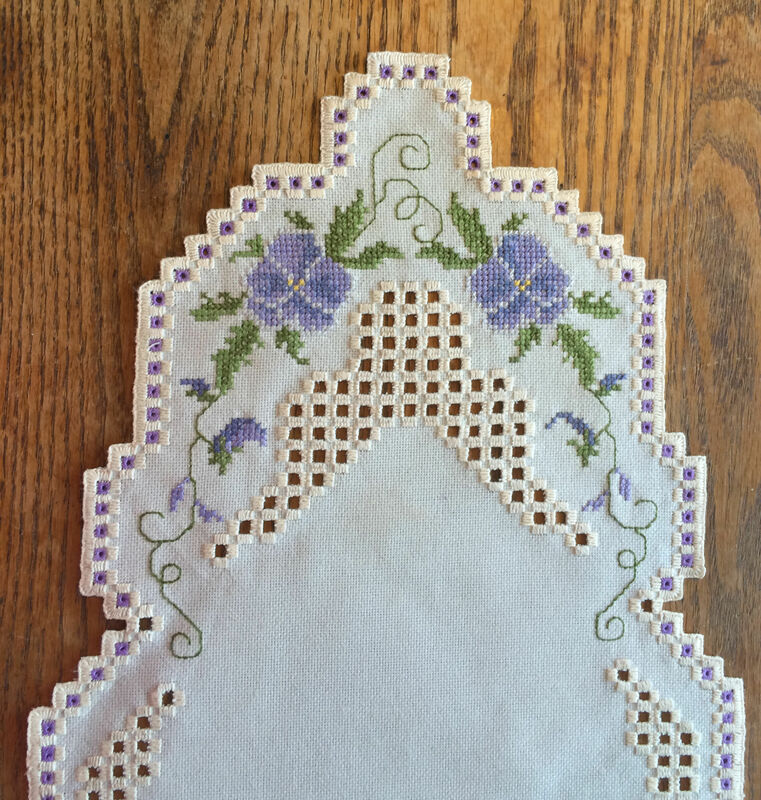 Here is my finished Pansy runner with the extra fabric snipped away. You can view the majority of my finished embroidery projects on my personal blog at a-stitching-good-time.com. Be warned beforehand that the text might be choppy within these postings because this blog is my journal. The place where I put quick notes on each worked item to remind me the threads I used and anything different that I did with a particular stitch. I am quite proud of each of my embroidery projects so I hope you will take a look at them.